Reagan Lee | Banner Jordan Heading, senior kinesiology major, keeps the ball away from guard Evan Leonard during a game against the University of California, Irvine. CBU men’s basketball is currently 15-11 overall and 6-6 in conference games. 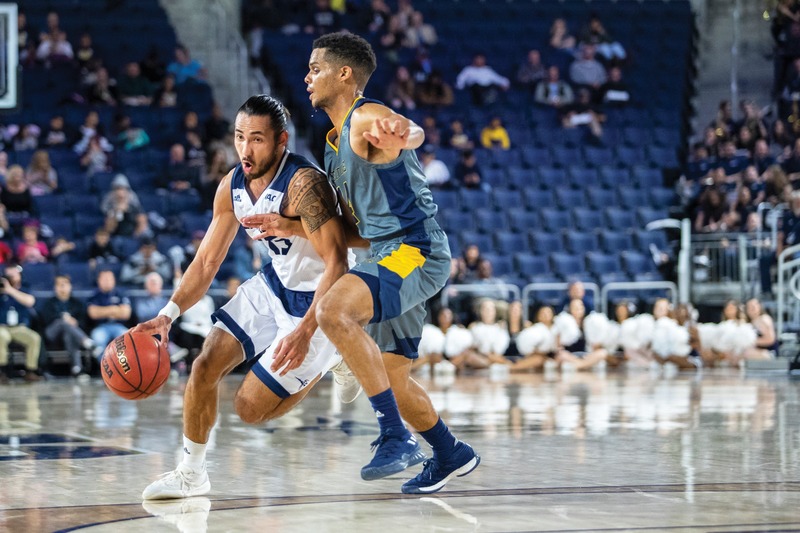 Guard Jordan Heading, senior kinesiology major, has contributed five years to the California Baptist University’s men’s basketball team. Over the week of Feb. 4–10, Heading was named Player of the Week of the Western Athletic Conference. Heading averaged 19.5 points, 7.0 rebounds and 4.5 assists per game. He tied his season high against UMKC with 24 points. Rick Croy, head coach of men’s basketball, said Heading is courageous and improved not only every year, but every season. “The guy has been unbelievable,” Croy said. Croy added he admires Heading’s improvement, both as a player and as a leader for the team. Heading said basketball has been a part of his life for as long as he could remember. Heading said he has developed as both a player and a person while being part of CBU’s basketball team. Thursday, the night before Heading’s senior day, Croy stopped the music at the end of the game, grabbing the microphone and asked the fans to come out and show their support for Heading and the five years he has contributed at CBU. After college, Heading said he hopes to continue playing basketball as long as he can and is looking forward to seeing what comes next.